Meet Sgt. Brooke Sharpe, Marine Corps Times Marine of the Year. She deployed to Helmand Valley, one of the most violent provinces in Afghanistan, and helped rebuild U.S. outdposts that expanded security and contributed to evacuation of wounded Afghan troops from the battlefield. Marine Sgt. Brooke Sharp was among the first Marines returning to Helmand province, Afghanistan. Her communications job generally deals with cyber, data and ­servers, and helping to keep the Corps’ internet, classified and ­unclassified, humming along. But when she touched down in Afghanistan in the spring of 2017, her job would become much more vital: helping save lives and drop precision ordnance on the Taliban. A 21-year-old Marine and New Jersey native, Sharp deployed with Task Force Southwest, a roughly 300 Marine unit, to one of the most violent provinces in Afghanistan: Helmand Valley. Afghan forces still lack efficient means to evacuate wounded and dead off the battlefields in Afghanistan. Sharp was selected as this year’s Marine Corps Times Service Member the Year for her extraordinary role in that deployment, when she worked in the Corps’ most far-flung and dangerous outposts. It was the first time the Corps had returned to its hallowed fighting grounds since 2014, and much work was needed to rebuild a fledgling Afghan force and keep the province’s capital of Lashkar Gah from collapsing to the Taliban. The security situation in Helmand had greatly deteriorated by the time Sharp and the other Marines touched down at former Camp Leatherneck — now Camp Shorab — a base in Helmand that once bustled with thousands of U.S. Marines and British troops at the height of the Afghan conflict. Taliban fighters were a mere stone’s throw away from the ­embattled Lashkar Gah, and the hundreds of interconnected ­patrol bases and command outposts that once dotted the Helmand ­landscape to help track Taliban movement no longer existed. Sharp’s job would quickly morph into establishing and linking remote outposts to help shine a light on Taliban activities. She also helped whisk wounded Afghan troops off the battlefield, a job way outside the scope of her original occupational field. At Bost airfield, located on the outskirts of Lashkar Gah, Sharp helped rebuild a command and control node for U.S. forces and an Army artillery unit blasting Taliban with M777 howitzers. “A lot of that was radios, communicating what grids we had enemy at,” Sharp said in an interview with Marine Corps Times. Sharp would deploy on three separate expeditionary advisory packages, also known as EAPs, to help build command and control outposts that could push data, live video feeds and seamless communications to help track and strike Taliban militants as well as keep an eye on Afghan forces’ progress as they launched operations to retake fallen district centers across Helmand. Her job at the remote outposts encompassed “constant ­communication and constant passing of grids to make sure we had air support,” Sharp said. The outposts served as a way for Marine advisers to assist Afghan partners fighting to expand the security bubble around Lashkar Gah, and to gather intelligence and push drone feeds on Taliban movements. In mid-July, Afghan forces backed by Marines with Task Force Southwest retook a strategic district located just outside Lashkar Gah known as Nawa. 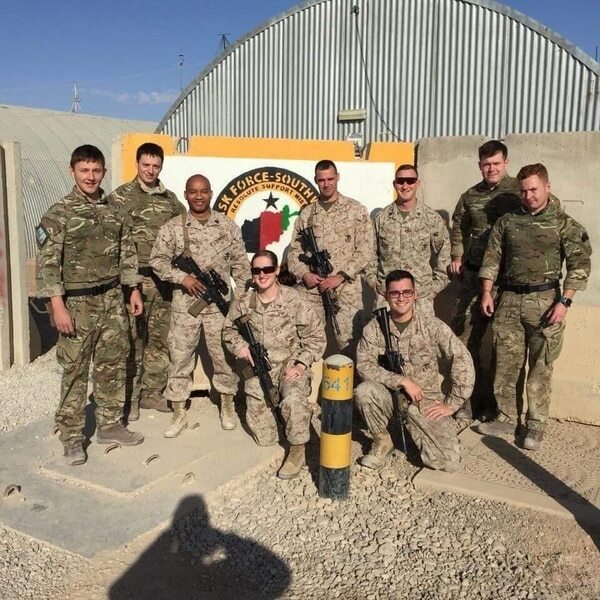 American air support during that operation helped boost the morale of Afghan forces fighting on the ground, ­something they had not been accustomed to since Marines left the region in 2014. Being close to the fight isn’t just for grunts anymore. “As we got district centers back into their [Afghan forces] territory, their attitudes turned around,” Sharp said. The command and control nodes Sharp helped establish and maintain were also used to help remove wounded Afghan troops off the battlefield. When the Marines first arrived in Helmand in the spring, the Afghan military’s medical and casualty evacuation capabilities were “very poor,” Sharp said. “They couldn’t get their aircrews off the ground,” she said, describing the Afghan air force at Camp Shorab. Helping Afghan forces to evacuate its wounded off the battlefield was also a major morale booster for Afghan forces. “Knowing they have an escape if they were going to get hurt is the biggest thing to keep them on the front line,” Sharp said. The small Marine task force would also go on to help train and build the Afghan army’s medevac and casevac capabilities. Sharp was a vital member of Task Force Southwest. Pushing way beyond her job field, she helped rebuild U.S. outposts that expanded the security bubble around Lashkar Gah and accomplished much of this without ever having gone through predeployment training exercises. Sharp replaced another sergeant with Task Force Southwest and was not notified she was deploying until the end of March 2017 — Task Force Southwest was wheels up to ­conduct two weeks of training in Kuwait around April 12, 2017, and touched down in Afghanistan later in April. Prior to joining the Corps, Sharp used to volunteer for her local fire department. She still volunteers with her local church. The Military Times Service Member of the Year award ceremony will be in Washington in July.